Kodi Smoothstreams addon: What is Smoothstreams? Is it safe to install? Smoothstreams Kodi addon: What is Smoothstreams? Is it safe to install? We take a look at the Kodi Smoothsteams addon including if it’s safe to install, what it does and if there are better alternatives. With the introduction of the Kodi Media Player, cord-cutters everywhere have been rejoicing. While in the past, people had to go to many different websites to find the content they were looking for, Kodi now allows them to integrate all of their various TV and movie subscription services into one player. This player has an intuitive interface that makes it easy to watch whatever they want, whenever they want. Kodi can be installed on virtually any device, including a Windows PC, Mac, Apple TV, Roku, or Amazon Fire TV. As expansive of Kodi’s content library can be, it is sometimes difficult to find legitimate sports programming. Many sports channels still have not caught on to the idea of offering their content online. The particular sporting events a user is looking for may not be easily obtainable. If you’ve been looking for a solution to this problem, you may have heard about the Smoothstreams Kodi addon. Is Smoothstreams legal? And how can a person be safe when using it? This guide will explain all you need to know about Smoothstreams addon for kodi, including the risks of installing it. Kodi is a very useful piece of software. It can allow you to stream many movies, TV shows, and other content online, however it carries privacy and security risks. Your ISP and others can see what you are streaming if you don’t take appropriate steps to keep you online activity private and secure. Worryingly, some Kodi addons are found on websites that may not be secure, it’s possible to end up with a malicious version. Addons installed through a repository can be updated and changed without you realizing it. Such was the case with the popular third-party addon Exodus, which was secretly changed by its own creator and used as a DDoS botnet. ISPs have been known to buffer customers who stream video since it uses a lot of precious bandwidth they would rather not provide. We advise you stick to official Kodi addons, as accessing copyrighted content may result a legal letter or warning from your ISP. Using a VPN prevents your ISP spying on your activity and protects your privacy. It will help stop your ISP buffering Kodi and other streaming and can protect against security risks such as Man In The Middle Attacks. We recommend IPVanish VPN for three reasons. All VPNs slow down your internet connection, some so much that Kodi will become unusable. IPVanish is among the fastest out there and has minimal impact on speed. Many VPNs log your activity, IPVanish does not, this is essential for maintaining your privacy. IPVanish works with all popular devices, if you want to install a VPN on your Firestick then IPVanish is by far the simplest and doesn’t require complicated side loading. Reader deal: Save up to 60% on IPVanish plans here. This includes a 7 day money-back guarantee so you can try it risk free. What is Smoothstreams for Kodi? Smoothstreams is an addon for Kodi that streams mostly sports content from ESPN, Fox Sports Go, the Tennis Channel, NBCSN, and many other popular channels. It also streams some movie and TV channels. It’s different from many other Kodi addons not only because of its emphasis on sports but also because it is a paid streaming service. The addon will not work unless you get a username and password for it. And this cannot be done without subscribing to a package using either Bitcoin or Paypal. Many users have claimed that it has higher-quality streams and and an easier-to-use interface when compared to other addons. So some argue that it is worth the extra cost. However, It’s important to emphasize that content-creators do not get paid by Smoothstreams for the use of copyrighted material. Even though users must pay to subscribe to it, most of the content is unauthorized, pirated material. Because of its use of pirated material, we do not recommend using the Smoothstreams Kodi addon. Instead, we recommend using one of the other sports addons listed below. 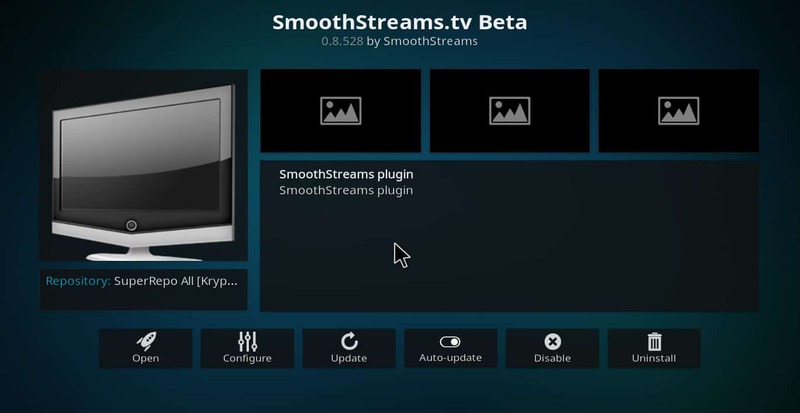 There’s no question that Smoothstreams is a very popular addon for sports fans that use Kodi. But it’s also a paid TV service that doesn’t compensate copyright holders. In addition, even though it might be more reliable than some free third-party addons, it still isn’t as reliable as legal streaming services. For these reasons, we recommend the following sports addons as alternatives to Smoothstream. Except where noted, each of these addons is available through the official Kodi addon repository. Playstation Vue is the streaming TV service offered by Sony. It offers a basic “access” package for $39.99/month that includes ESPN, ESPN2, FS1, FS2, and NBCSN. You can add NFL Network, NBA TV, Big Ten Network, Golf Channel, and a few others for $5 more. No cable box or set-top box is required. 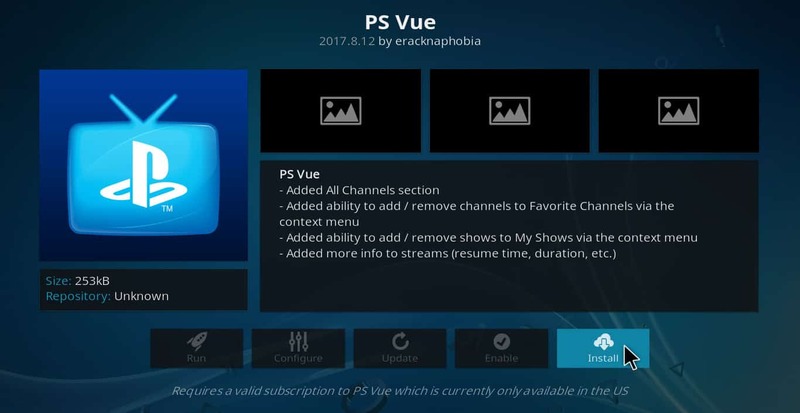 And the Playstation Vue Kodi addon allows you to fully integrate the service with your Kodi media player. SportsNet is very popular sports TV channel in Canada. You can get an online subscription for around $25. This includes Sportsnet, Sportsnet One, and Sportsnet 360. These channels carry a wide variety of NHL, MLB, NBA, and Premier League games as well as Indycar races and other events. They also produce some highly-rated sports talk shows. 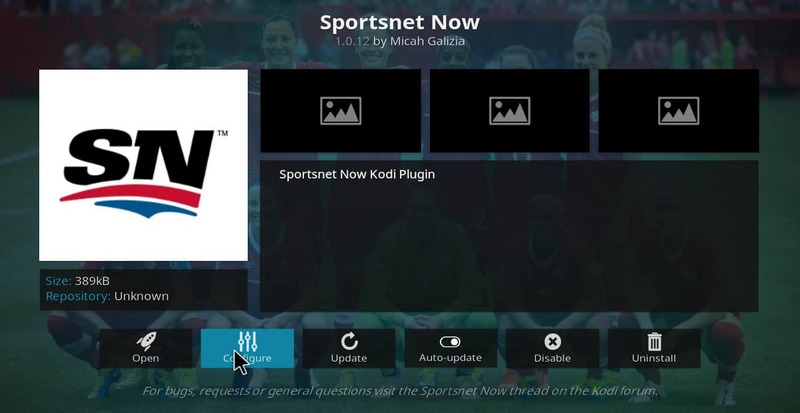 The SportsNet Now Kodi addon allows the service to be easily used as part of Kodi. And with a VPN, you can watch it even if you live outside of Canada. 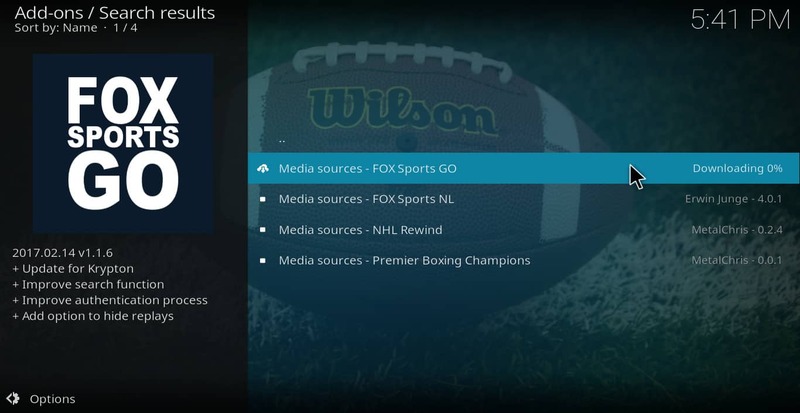 Even if you’re not using Playstation Vue for your primary TV package, you can still access Fox Sports channels through the Fox Sports Go Kodi Add-on. Just put in your credentials from Sling TV, FuboTV, or a cable provider. 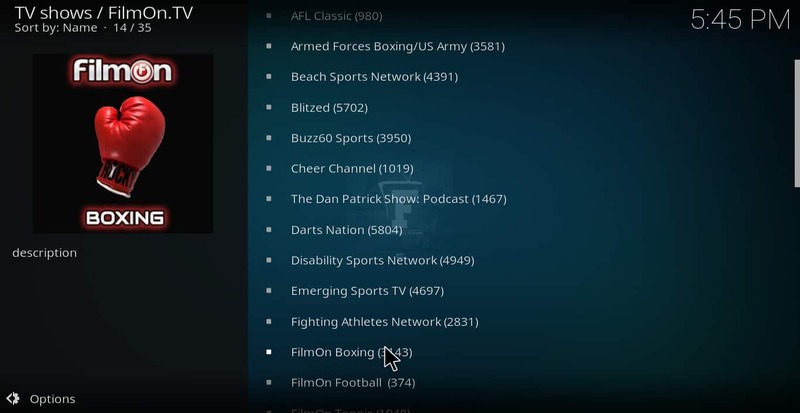 This gives you access to all of the Fox Sports channels you would have on these platforms, but through Kodi. FilmOn is a completely free streaming video service. For sports fans, it is especially useful for finding MMA, boxing, motocross, watercross, and other extreme sports content. It doesn’t have much in the way of baseball, basketball, or football programming. But if you enjoy these other sports from time to time, it can be a great supplement to the other addons on this list. FilmOn can be located in the Noobsandnerds addon repository. 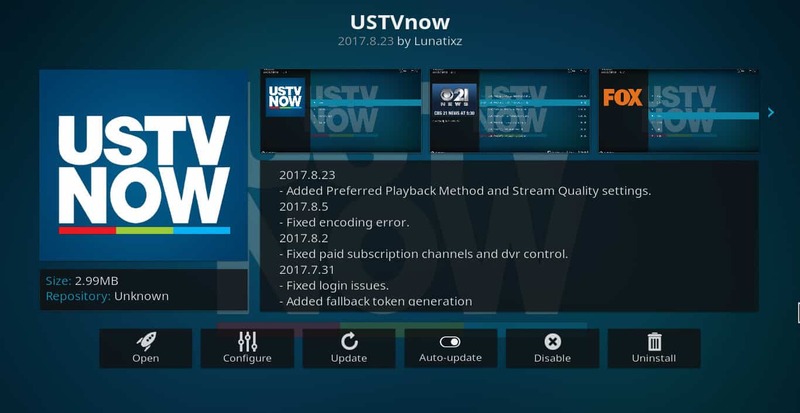 Although USTV Now is a service for American military stationed overseas, anyone can sign up for it. The free version of the service includes ABC, CBS, CW, FOX, and NBC. Many major sporting events are carried on these channels. For $19.99/month, you can add ESPN and ESPN2 to the lineup as well. Given the popularity of Smoothstreams, it’s important to emphasize how it works. Smoothstreams does not host any content directly. Instead, it uses complex algorithms to search throughout the internet to find the content the user is looking for. The most obvious concern in using the service is accidentally streaming pirated content and ending up getting flagged by your ISP. But there are other risks to using Smoothstreams as well. In the past, third-party Kodi addons have been targeted by “man-in-the-middle” attacks. These happen when a hacker creates a new version of an addon, which he then convinces Kodi users to download. Once the hacker accomplishes this, the addon is used to spy on the user to gain sensitive information. Not only can hackers find out a user’s streaming habits with this strategy but they can also find out information on a user’s hard drive. There are many legitimate Kodi sports addons available outside of SmoothStreams. It’s popularity aside, SmoothStreams comes with far more risks than most official addons and should be avoided. See also: Should you install the Kodi SportsDevil addon?